Since its founding in 2001 M&E has been a pioneer and leader in calculating and raising the ROI of human capital in companies. We are a research and consulting firm founded in 2001 with the support of IE Business School, Madrid, with a presence in Madrid, New York, Sao Paulo, Zurich and Hong Kong. The M&E Group consists of Management & Excellence SA, Madrid and M&E Global Inc., New York. M&E calculates the financial risk / return of human capital, recommending how to reduce risk and raise the Return on Investment (ROI) of human capital. 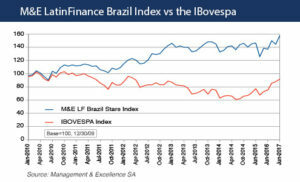 Using the M&E GOVERNANCE DISCOUNT RATE, the M&E LatinFinance Brazil Sustainable Stars Index has outperformed the Ibovespa benchmark by over 68.0% (Q1 2017) since December 2009. The Index consists of Brazil´s best managed listed corporations. M&E signs a JV agreement with Satisfi Labs, Inc. NY. Satisfi is a high tech provider of artificial intelligence surveys to be employed in M&E´s ROI of Human Capital projects. M&E´s executive survey and study for TozziniFreire: Outlook on the 2017 legal trends in such areas as mergers & acquisitions, ROI of governance and IPO´s for Brazil in 2017. How much of China´s internet companies are driven by intangibles? Together with its partner BDO Financial in Hong Kong, M&E published results of its study in Asiamoney. 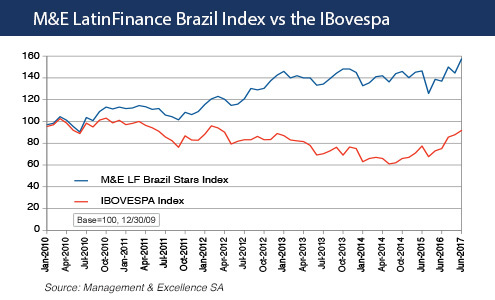 M&E publishes a bi-monthly "Itau Latam Monitor" in LatinFinance on key research by Itau BBA on Latin America. M&E awards CCB Brasil a sustainable management rating of "A-" with a positive outlook based on expected support by CCB. More than $ 1 trillion is expected to be invested in critical infrastructure around the World over the next decade. Yet there is no true risk analysis method for quantifying infra project risk and achieving a fair risk balance in PPP´s. Thus, investors are holding back investing in infrastructure. Value for Risk (VfR) builds on the Value for Money method which inadequately projects returns of infrastructure investments for PPP´s. Value for Risk calculates and balances risks within PPP´s, making them predictable investments for all stakeholders.